The excursion will spend you through the modern industrial city – Zhodino where you with own eyes will see as giants of the Belarusian and world mechanical engineering – BELAZ are born. They work in dozens of the countries of the world. Production of the plant won not one prestigious award of the international level and became the repeated champion of the Guinness Book of Records. Today "BELAZ" not only brand of the career equipment, but also brand symbol of independent Belarus. Take a ride on BELAZ! A rental service is available at an additional cost. To order a rental on a dump truck, you must contact the employee of the ekskursii.by portal via e-mail or by phone at least two working days before the trip. The rental price is 120 BYN. Only one excursion is allowed in the cab of the dumper. The rental period is 10 minutes. Please note that the rental service on the dump truck assumes that you are in the cabin as a passenger. The car is managed by a factory employee. Try yourself as a dump truck driver on a dynamic simulator. Thanks to the simulator you will find yourself in a distant career, where you will drive a dumper with a full body of minerals mined in various weather conditions, along specific career paths. The cost of the «Dynamic Simulator» service is 35 BYN, 10 minutes. The service is carried out with preliminary recording and with small individual groups. You are expected by a fascinating excursion on the Mogilev Automobile Plant - the place where the history of the Belarusian production of giant cars is born. Here everyone not only will get acquainted with know-how, but also own eyes will see pride of the domestic autoindustry. 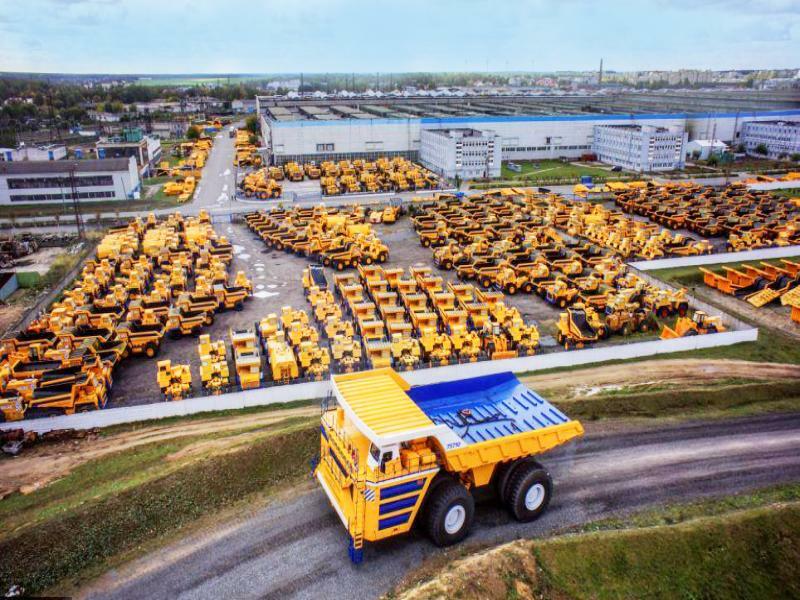 The BELAZ – one of the largest global manufacturers of the career equipment. Production of the plant won not one prestigious award of the international level. One of dump trucks, the 450th tonic, - the champion of the Guinness Book of Records only twice! During the excursion you will visit one of assembly shops and will see the birth of a legend of the Belarusian mechanical engineering. On the exhibition platform of the equipment it is possible not only to take impressive pictures against the background of the legendary car, but also to feel all its power, having got on the car. Today "BELAZ" not only brand of the career equipment, but also brand symbol of independent Belarus. 04-January-2019 Нам понравился ваш гид. Но экскурсовод на заводе рассказывала не очень интересно, хотя была очень доброжелательна и хорошо решала все организационные вопросы. 07-July-2018 Большое спасибо за исполненную мечту - покататься на БЕЛАЗе. 21-April-2018 Чаепитие было неожиданным сюрпризом! А машинка стоит дома как напоминание о поездке ?